Ayurveda, Secrets of Healing is a seminal work, the basis of which is deeply rooted in the scriptural knowledge behind Ayurveda. Maya Tiwari demonstrates in meticulous detail the power of our own nature-based memories as the primal force of human healing. She introduces the ancient secrets of sadhanas, i.e. spiritual practices, therapies, remedies, diet and natural biorhythms - which, when applied, awaken the cognitive memories necessary to achieve our deepest personal healing. Secrets of Healing is the most complete offering of the original cleansing and rejuvenative therapies, Pancha Karma, first taught and practiced by the ancient Vedic seers. In the definitive work, Maya Tiwari is the first author to reveal these sophisticated and timeless healing processes in a way which is both comprehensive and readily adaptable to modern western culture. Over twenty years ago, Maya Tiwari healed herself of cancer through her fortitude and spiritual strength. As a result, she re-directed her life, beginning her holistic studies in Oriental medicine. She later returned to her roots in the Vedas and was carefully tutored by Swami Dayananda, one of India's few living masters of the traditional teaching of Vedanta and Sanskrit. She has been trained to preserve the precious oral teachings of the most ancient spiritual heritage, the Vedas - and has since devoted her life to the study and teaching of Ayurveda and Vedanta. In 1992, Maya Tiwari was initiated by her teacher as a brahmacarini, one whose life is committed to the study of the Vedas. Being a traditional Vedic monk, Bri. Maya lives a simple life in Asheville, North Carolina, and teaches with love and selflessness the ancient wisdom of sadhanas, the art of consciously participating in the wholesome activities of nature. Over the years she has assisted hundreds of cancer patients, and more recently AIDS patients, through their "dark night of the soul" into good health. Bri. Maya co-authored Diet for Natural Beauty with Aveline Kushi and has written the current best-selling Ayurveda: A Life of Balance, the definitive work on Ayurvedic nutrition. on the surface, the author of this book, a descendant of Indian Hindus transplanted to British Guiana (now Guyana), and the writer of this foreword, born of Swiss/German parents in Helena, Montana, would seem to have little, if anything, in common. One from the fertile rice fields and redwood forests on the salty shores of South America; the other from the mountainous ranch country on the eastern slope of the Rocky Mountains of North America. One a Brahmacarini who has stood in the cool waters of the Ganges, walked the Himalayas and lives her life in Shiva according to the knowledge of the Vedas; the other an actor/writer who has fished the Missouri, climbed the Crazy Mountains and floundered through his life, both public and private, with only a curious soul and boundless hunger for Truth to guide him. But beneath the surface of all this biographical detail, all these "differences" (by which we are all taught to revel in our uniqueness and jump to the conclusions that make us unhappy, disenchanted and divided), be- neath and beyond all this lies the "real nature" that is the cosmic Truth of Maya Tiwari and Dirk Benedict-and indeed, of all of us. For no matter how unique, how different, our life experiences, we are all brothers and sisters, born of the same universe and sharing the same cosmic dream. I know this is true because a little thing called cancer told me so; and it is there, in the experience of that spiritual disease, that I found my universal being and had my peek into that part of my Self that is all of us. The talented writer and enlightened creator of this book that you hold in your hands has also experienced her spiritual disease. I always suspected that cancer was my spiritual salvation. With the passage of time (and increased well being) came the faith that allowed me to give voice to that suspicion and to the deeper suspicion that the physical disease that is shortening the lives of many of us and that we give many names--cancer, heart disease, diabetes-and call incurable, is nothing of the sort. But rather is this physical de- generation merely a symptom of our loss of memory, memory of our true Self, of all that went before, generations beyond counting, and of all that is yet to come. For everything that is, has been, or will be, is written on the infinite pages of the Cosmos; I know this is true for I have had my carcinogenic glimpse into that Cos- mos. It is this Cosmic Memory which Maya unfolds in this book that reveals to us our sacred, spiritual nature, and allows us to proceed with what we call life; reveals to us our timeless mind and ageless body, makes us whole and harmonious ... and One. Maya Tiwari too, as she relates in this book, had her "dark passage" through the valley of cancer. Mine was at the age of twenty-nine, hers at twenty-three. That we both survived our dark journeys is not the point, but rather what hap- pened to us along the way: abandonment of false beliefs and perceptions; acceptance of our true, that is to say our divine, nature; acceptance of responsibility for our disease and for our rejuvenation. Cancer was the obstacle in our lives, the celestial mountain we climbed, and through which we connected with our true self. To deny personal responsibility for such celestial obstacles and ask for, de- mand, surgical, chemical, man-made salvation, is to deny our divine nature and miss the point entirely. What we call "incurable" is really missed opportunity: missed opportunity for the growth that is our physical rejuvenation and spiritual salvation. The man who writes this small foreword is everyman. Not an expert, a physi- cian or holder of a Ph.D. from any field of specialization ... his expertise is nil. Cer- tainly he is not a guru or sage or otherwise enlightened being. That he is still alive and capable of the thoughts of this humble foreword is solely because, when his false lifestyle resulted in the physical degeneration that was his celestial obstacle, he got the message. And it was divine. And it is here on these pages that you are about to read. This book, as the person who wrote it, is like the ocean. We need only stand on the shores of our being, and the spiritual, which is to say essential, reward is inevitable. Stand on the beach of any ocean and gaze out at the vastness, or qui- etly ponder the pages of this book; you will be gently nudged towards your divine self by both experiences. The recovery of your eternal memory is up to you, but you will never again be without the tools with which to begin that journey. So beware! To have this book in your hands is to have the oceanic presence of Maya Tiwari in your home, to have the Cosmos in your soul...remembered. There is a universal collective that connects us all via the spiritual umbilical cord that is our true Self. This book holds the teachings that make realization of this possible for all of us-in this lifetime. If there are those of you that feared the ancient tradition of Ayurveda and its secrets of healing were in danger of being lost, here is the work that lets us all sigh a collective breath of joy. For within these pages the primary healing practices, teachings and ancient scriptural knowledge of Ayurveda that has been handed down for thousands of years-from sage to sage, master to master-have been made available to us in the written record that is this book. Welcome to a complete healing for your soul-a myriad of therapies and reci- pes by which to recover your vitality and joy of living and lose your disillusion- ment and fear of death. Read it at your own risk, for you may lose your self in it ... your false self. And find true health and happiness and eternal life. The cool waters of the Ganges rush steadily over my feet. I hear God's ice in the raging thunder. The whirling sands, supported on the wings of the driven wind, take the forms of my ancestors' faces. Little do I know the true purpose of my visit to India until I stand transfixed in boundless space and infinite time. I behold the faces of my beloved people whose blood and spirit run through me. I hear the cries of my ancestors finally silenced, as the debt for their estrangement from the homeland more than a century before is paid. The first of my people to return to the sacred land of India, I am here, through the grace of my teacher, Swami Dayananda Saraswati, to receive my initiation as a Brahmacarini. As I stand in this holy river declaring my intentions to live fully within the knowledge of the Vedas, to live in Shiva, I must never forget this moment. My journey in this life began in the early fifties in a country then called British Guiana (now Guyana). My grandparents were exported from India by the British. The Indians came as indentured laborers, slightly more fortunate than the Afri- cans who were brought by force as slaves. My people came as priests to minister the Hindu scriptures and console vast numbers of humans who were stripped of family, villages, culture, habits, and, most important, their homeland. Like those belonging to a second generation, I grew up without knowing my grandparents. They died young, like so many others who became confused, mad, or riddled with diseases. My parents carried the heavy burden of carving a new life in a new land while maintaining the traditions left far behind across the seas. Tra- ditional dlrarmas, never to be witnessed again in the homeland, became a cher- ished and sacred memory, observed with resolute devotion. I was fortunate to have had, from an early age, a teacher of colossal magnificence, my father, the proverbial jack of all trades. The youngest in his family, and blessed with rare qualities of vision, strength and devotion to his people, he crossed the invisible bridge between India and Guyana while carrying his entire family, immediate and extended, squarely on his back. His wisdom and selfless sacrifices advanced his people, and in particular his children, through multi-cultural barriers and archaic technology, into the twentieth century. Because Guyana remained fifty years be- hind the rest of the world technologically, we were ten-fold closer to the natural ways of sadhana, which, in the last few centuries in India has been translated as "religious practice," but which I have taken the liberty of reviving to what I be- lieve would have been its original meaning: wholesome activities practiced in har- mony with nature. Eleven children, blessed by two mothers, grew up in the dear and precious lap of nature. The idyllic field of childhood play stretched from the black, salty creek waters to the stiff khaki school uniforms. Fragrane chamelis thickened the air; bails of Indian cotton sprawled across the merchants' tables; the virgin green rice fields danced in the masala flooded air; milk so white it turned blue in moonlight; skins so black they reflected the sky; these are the memories of my country, It was a vast and mysterious land layered with British noise, Indian harmonics, and African rhythm, but the smell of my people was not there. The vibrations braided into their very being were left far behind. I loved the elders with a raging passion. I huddled in their midst to sniff and smell their scene, somehow knowing that I too could not live without their innate memory. Meanwhile, the British rule abroad was coming to an end. Guyana was one of her last adoptees, My father foresaw the inevitable fate of a fourth world country soon to gain her independence, and skillfully honed his older children, with the prowess of creative missiles, in preparation for exportation to England, the United States and Canada. In my case, I received college equivalent degrees from Lon- don University by the soft green age of fifteen. My country became independent, and the inevitable bitter racial wars began. Less fortunate than those of us who were sent abroad before the painful struggle began, my parents, the younger sib- lings, the aged, and the indigent were caught in the vicious cross-fire of bloody war. As the usual atrocities of war demeaned nature, the fertile fields and prolific land Were laid waste, the crystal streams and black waters poisoned, the redwood savegely felled. Guyana, once exquisite and prosperous With her mighty rivers reservoirs of immense riches in gold and minerals, and pre-history species residing in the highland rain forests, remained silently weeping in shame and obscurity for decades. Once more my people moved on and re-settled, this time Canada. Peerless and pressed beyond the constraints of mind and spirit, I abandoned myself to cancer at the age of twenty-three. I let my mask fall and shatter into oblivion. The light of the Divine peered through the crevices of my broken body. My expensive, false self was dying at the same time as my divine nature hunted me down. Through my five-year sojourn with cancer, I was able to cognize my karma and my purpose for being here, and re-structure a life which both honored my past and allowed my present. I was able see my real self, beyond pain of my people and the conflicts of my early dualistic perceptions. In fact, I discovered nature and re-acquainted myself with the poignancy and rich beauty of the Simple daily sadhanas of my childhood years. Through the cognition of my own spiritual recognizance, timeless sadhanas, and the help of one ingenious and remarkable human, Dr. James Holland, I healed into a new being. Today marks my twentieth "year since I leaped from the ashes of cancer to begin my studies of the holistic principles of life. My work with nature's sadhanas continues to grow with the knowledge I have gleaned from the Ayurvedas and Vedanta. Boundlessly poignant in their healing abilities and vital to the culling of human divinity, the sadhanas presented in this book are adapted from the Ayurvedas .. Moreover, they reflect my myriad experi- ences through life's fiery passages and the awakening of my deep cognitive memo- ries. I am not a physician, Ayurvedic or otherwise. My intentions are to share the healing secrets I have learned from practice, both in my personal life and with the many I have helped through the dark passage of cancer. Most of all, I pray to live in the wisdom of the Vedas to discover innocence, my true nature. Sanskrit is thought to be much more than a language in that it is said to reflect cosmic sound itself. The first manifestation to emerge in the universe in the form of gravitational and vibrational fields, cosmic sound nurtures, births and sustains all other manifestations. Are we not told that the Supreme One sent the multiple forces of creation through shabda brahman, the word? In the form of Varnas, pure vibration and profound silence, God's numinous energy manifests, creating the audible or imperfect sound and visible form. Using Sanskrit, therefore, is consid- ered to be the first sadhana, wholesome practice, that, if followed, instantly re- minds us of our connection, our relationship, to the One, the Whole. The many gods of the Vedic pantheon are considered to be the seeds of the universe. From these seeds, every precise letter of the Sanskrit alphabet has been developed, portraying the various facets of the Divine Mother. Using Sanskrit, originally called Devanagari, literally, "the means of communion among the gods," is also a means of attuning to the cosmic vibration of the universe. The circum- spect intonation of a word, phrase, mantra, or prayer in Sanskrit, even without knowledge of its meaning, has been found to bring clarity, prosperity, and bound- less poignancy to life. The seed syllables, or combination of Sanskrit letters con- taining the sum total of each deity or symbol of divinity, are the most effective mantras, the most powerful being Om. The proper intonation of Sanskrit syllables and words in the form of mantras purifies ojas, our biological essence, tejas, our mind's subtle fire, and akasa, our subtle vibrational field. Each word is derived from a verbal root having an absolute meaning, without ambiguity or cultural con- notation, and therefore conveys an equally absolute meaning. Wanting to share this sadhana with you, my reader, I have maintained my practice of using the Sanskrit words and names which apply to most of the therapies and medicines discussed in the book, providing whatever explanation deemed helpful along the way. May you be enhanced by this wholesome practice. Om. T he Vedas, made up of the Rig, Yajur, Sama, and Atharva Vedas in which the ancient scriptural knowledge is found, have been handed down to us generation by generation over several thousand years of oral tradition, before finally being recorded in written form. It wasn't until about SOO B.C. that the sage Adi Sankara culled the end portions from the Vedas, called Vedanta, which reveals the knowledge that the self and the Supreme Being are one. Sankara recorded this knowledge on palm leaves, along with vast commentaries on the subject. Rig Veda, the foundation pillar and oldest of the Vedas, contains many references to Ayurvedic principles, although Ayurveda itself was primarily developed from the Atharva Veda, the most recent of the Vedas. The mainstay of the Ayurvedic knowledge we have today is found in the two great treatises, charaka Samhita and Sushruta Samhita, each of which first appeared at the turn of the first millenium B.C. Charaka Samhita remains foremost, focusing on the internal body/mind medicine of Ayurveda, in which the cause of diseases and the constitution of a person are addressed first. 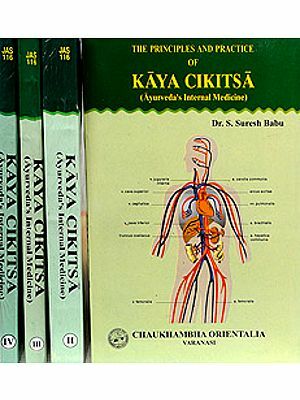 The knowledge of Ayurvedic surgery and the details of its techniques, contained in the Sushruta Samhita are lost to us today, these practices having been interrupted at the end of Buddha's life. During the medieval period, the rejuvenation and virilization therapies, known as rasayana and vajikarana, were introduced into the Ayurvedic panoply of healing practices. Around 500 B.C., Ayurveda was formed into eight branches of medicine and two primary schools of thought named after the sages Atreya and Dhanvanrari. Charaka belonged to the Atreya school of Ayurveda and Sushruta to the Dhanvantari school. Pancha karma therapy, the core of Ayurveda's healing therapies, is believed to predate even the earliest applications of Ayurveda, which is thought to have oc- curred some 8000 years ago. Although it has endured long periods of interruption in India, pancha karma is still practiced in many regions of the country. Central to a phenomenal system of ancient healing techniques said to have been practiced by the gods who taught the earliest seers on earth, this therapy remains the most vital link to the essential and immortal essence of human life. The term pancha karma refers to the five principal practices used to cleanse the body of its excess bodily humors, called doshas. Although Charaka did not coin the term "pancha karma. ft he did introduce these cleansing practices as the axis around which all Ayurvedic healing therapies revolve, defining it as the one pri- mary independent discipline to be employed in order to promote health. Charaka considered it a requisite procedure before surgical operations or the administra- tion of any of the rejuvenation therapies. Pancha karma benefits both the healthy and unhealthy and is considered to be the most effective therapy for preventing and curing diseases, as well as for revitalizing the entire human organism. Ayurvedic massage was developed, along with lalon (a form of martial arts), to enhance the welfare of the early warriors, and is still used extensively in the Kerala region of India. It is a requisite to precede pancha karma therapy. This massage is based on knowledge of the body's marma points, the anatomical sites where muscles, nerves, blood vessels, joints, ligaments, and bones enjoin. Recog- nition of marma points historically precedes and is comparable to that of the meridian points used in acupuncture. Although there are many variations of current massage practices in India. differing somewhat from classical Ayurvedic applica- tions, the methods used are still valid in terms of their effectiveness in regaining and maintaining health. 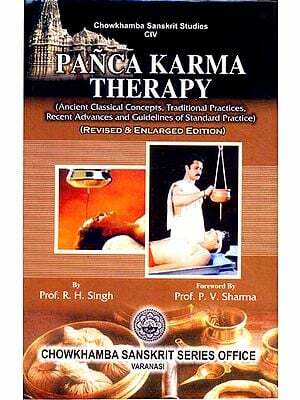 Pancha karma is the core of a vast mandala of therapies. In this mandala, there are two main categories, shodhana and sharma.Shodhana refers to pancha karma's five main cleansing and elimination procedures, while shamana encompasses the supporting therapies that are the preparation and post-therapy measures for pancha karma proper. Both groups of therapies are included here as a mandala of healing practices, since both shodhana and shamana braid together to form a stupendous human synergy of potent rejuvenation and rebirth. Existing in the body of all living organisms, the five elements congregate in a certain pattern and are known as doshas, bodily humors. The three doshas, Vata, Pitta and Kapha, arereferred to respectively as the air, fire and water principles of the body. Because the human body maintains a delicate homeostasis, the process of eliminating its manifested doshas and diseases is a systematic act of cajoling, tempering, shocking, and nurturing the body. The excess doshas are never forcibly removed from the organism. In classical practice, an intricate weave of knowledge of the seasonal effects on the tissues, the precise time of the doshas' advances, the overall condition of the person, the phases of the moon, and the pertaining signs and symbols of the surrounding animals and birds all contributed to the timing and nature of the applied pancha karma treatment. Today, the minimum observation of pancha karma therapy practice involves three distinct phases preparation, main action, and post procedures to sustain the effects of the therapy. Shodhana, the central and primary action in the mandala of treatments, is administered in the following sequence: emesis, purgation, unctuous enema (optional, depending on the person's condition), medicated decoction enema, and nasal in- sufflation. The timing and number of applications vary, depending on the specific condition being addressed. Before these five karmas, or actions, are administered, a certain period of time is spent on the necessary preparatory actions. Two main shamana therapies are administered: a combination of snehono and obhyongo, which involve the thorough oelating and massaging of the entire body, followed by soedana, the inducing of sweat through fomentation. These treatments cajole and prepare bodily tissues, as well as the mind and spirit, for the central and primary course of elimination therapies. While all of the shamana therapies may be used independently of pancha karma, pancha karma may not be performed without the preparatory and sustaining treat- ments of the shamana therapies. The shamana therapies are rejuvenative and strengthening in nature, whereas the shodhana processes of panch a karma are cleans- ing, emphasizing elimination and depletion. Following the pancha karma treatments, a third phase of healing practices is observed. Programs of wholesome activities, diet, and Ayurvedic teas or medi- cines are designed for each person, in order to sustain the results of the treatments received. The mandala group of therapies in traditional use not only restores complete health, but more importantly, enables us to enjoy a sense of rebirth. When the necessary observances of sadhanas are continued, not only as a medium for post therapy, but as an integral part of our everyday activities, we are able to touch and draw upon the potential immortality imbued in the human species. 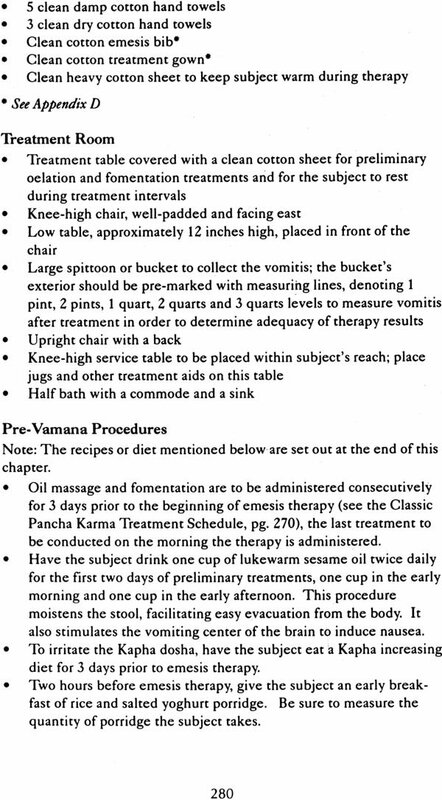 The shamana therapies, which are often used to support the pancha karma menu of therapies, include the preparatory treatments of oil massage and fomentation treatments as well as the follow-up therapies-nourishing foods, fasting, wholesome activities, and medicinal herbs and substances, among others. Whether they are used with panache karma or independently, they need to be administered with full awareness of the prevailing seasonal influences and the condition of the dashes in the body. Within the shamana group, there are six distinct therapies, which fall into two categories: langhana, which deplete the body, and brhmana, which add strength and substance to the body. These terms, langhana and brhmana, not only refer to specific groups of treatments but are also the names given to two specific post pancha karma regimens. 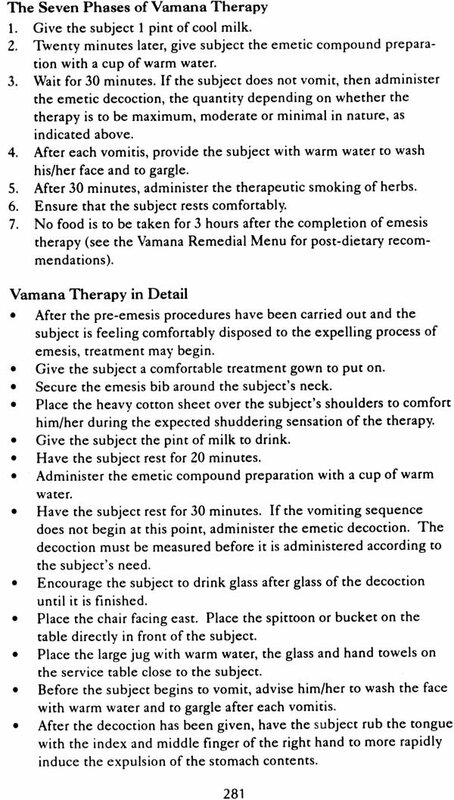 In their group context, langhana and brhmana each cover three aspects of the six shamana therapies. For instance, the langhana group encompasses svedana, sweat-inducing therapy, and rukshana, dehydration therapy, as well as the langhana regimen Itself, meaning those post panch a karma or independent body depleting measures such as fasting and physical exercise. The brhmana group covers snehana, oelation therapy, and stambhana, retention therapy as well as the brhmana regimen, those post pancha karma or independent body building measures such as the use of nourishing foods, herbs, and unctuous substances. Langhana treatments are used primarily to reduce Kapha and Pitta conditions and to alIevilate specific conditions like blood disorders, skin diseases, extreme stagnation of malas, bodily wastes, and obesity. The characteristics of the medicines and procedures used in this form of therapy are light, hot, sharp, rough, mobile, and hard. Langhana treatment is more a group of sadhanas than therapy. The various langhana sadhanas which safeguard against bodily excesses are: fasting; the use of herbal therapy to promote and maintain digestion; the preparation and use of wholesome foods such as the sattvic and energizing diets, discussed in Chapter Eight; wholesome exercises; and treatments performed in the open air and bright sunlight. The second treatment of langhana therapy, called rukshana, is a process of dehydrating the body. Rukshana favors all the qualities of the medicines and pro- cedures used in the langhana group with one exception, in that it produces a stabi- lizing effect on the body. Usually, a treatment in the langhana genre is mobile in nature. Although it is best suited for conditions like water retentive tissue which are more likely to need dehydration than depletion, the rukshana form of treat- ment may also be used for excess Pitta and Kapha conditions. Major diseases which are located in the marma points, vital junctions of the joints and muscles, are usually treated with the rukshana procedure as well. The main and third treatment of the langhana group, called svedana, has an infinite number of procedures within it to induce profuse sweating through fomentation. According to Ayurveda, this procedure may be administered only after the body is lubricated and properly massaged. Svedana, an invigorating procedure, is specific to Vata and Kapha disorders but may also be used for some Pitta disorders. Brhmana, the second main group of shamana therapies, provides the body with strength and substance. This group of treatments is specifically geared to major Vata disorders, such as emaciation and the diseases of old age. Many forms of injuries and addictions are treated successfully with this group of healing ac- tions. Conditions. requiring brhmana measures may be treated throughout the year, although these strengthening treatments are usually administered in the sum- mer when human weakness tends to be at its peak. The qualities of the medicines and procedures used in the brhmana group of therapies contrast dramatically to those used in the langhana forms of treatment. The characteristics of brhmana treatments are heavy, firm, cold, soft, oily, clear, slow, and smooth. Brhmana treatments, also more a group of sadhanas than therapies, are tai- lored to relieve the many grievances of Vata, as well as to restore balance to all three doshas after the dramatic cleansing actions of panch a karma. These treat- ments consist of nourishing and strengthening foods such as the post panch a karma diet as well as herbal therapies to attenuate conditions such as chronic and debili- tating diseases. Ayurvedic massages with aromatic and medicinal oils, sleep therapy, nurturing teas, and brews made with substances like ghee and natural sugar cane juice, are all considered brhmana treatments. Anuvasana vasti, a medicated oil enema formulated to' simultaneously remove excess Vata from the colon and enrich the tissues, is considered both a pancha karma measure as well as a snehana treatment belonging to the brhmana group. The treatment itself is described in detail in the section on pancha karma therapies. The main treatment in the brhmana group is called snehana. The literal mean- ing of "snehana" is "love." In this love therapy, ample amounts of oil are used to massage the body into a blissful state. A vital form of treatment in its own right, snehana is an excellent salve for all three doshas, particularly Vata. Snehana procedures include oelation treatments to the head, such as sllirodllara, the process of dripping oil on the forehead, and mastllislya, the application of paste to the head. The second treatment within the brhmana group is called stambhana, that which allows retention in the body. Stambhana favors all the qualities of the medicines and procedures used in the Brahmana group with one main exception: it facilitates dryness, whereas a Brahmana form of treatment is usually unctuous. The stambhana form of treatment is specific to conditions such as severe burns from fire or alkali, poisoning, diarrhea, vomiting, and many Pitta-rype disorders. Because it employs substances with dry, retentive and mostly cooling medicinal prop- erties, stambhana is generally considered a more appropriate treatment for Pitta conditions. When the mandala of therapies are all performed together the process takes approximately one month. A specific classical schedule (see Chapter Seven) is recommended when all five actions of pancha karma are required. Depending on the nature of the condition being treated, fewer therapies may be administered.